Created in collaboration with the multiple Grammy-nominated producer, musician and mixing engineer (Adele, Katy Perry, OneRepublic), ToneCentric gives you easy access to Greg’s signature harmonic enhancement techniques, as heard on hit recordings that have sold over 85 million units. "I’m always on the hunt for ways to pull more music out of the speakers. You get a beautiful effect when you run audio through healthy vacuum tubes and big transistors wound the right way, and record it to a great tape machine. This plugin is an homage to the great analog gear that leaves a wonderful sonic footprint on your sound." "There are certain pieces of gear in my studio that consistently do this for me without fail: a holy grail 1950s mono tube compressor, a tape machine, a custom-made vacuum tube console." 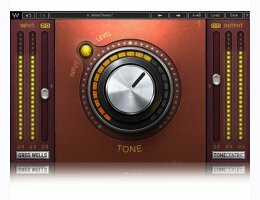 "Several plugins do a great job pointing in this direction, but sometimes I find the high-end suffers. In developing ToneCentric, it was important to me to keep things sonically quite full overall, but with an added depth of field." "As with all the plugins in my Signature Series, there is an enormous amount going on behind the simplicity of the single-knob interface. Different settings on the knob will yield different results and I encourage you to experiment with subtle to mid to drastic levels." "Here’s to more tone-filled music! I hope you like it as much as I do."